We’ve all attended conferences, workshops, and online discussions, which focus on improving customer retention, boosting engagement, and getting those all-important recurring sales. We’re told the importance of the customer journey; that we must be more relevant; that by being more relevant and improving the journey, we’ll increase customer engagement; that this is the key to our future business success… but what the majority of these seminars fail to cover, is HOW. 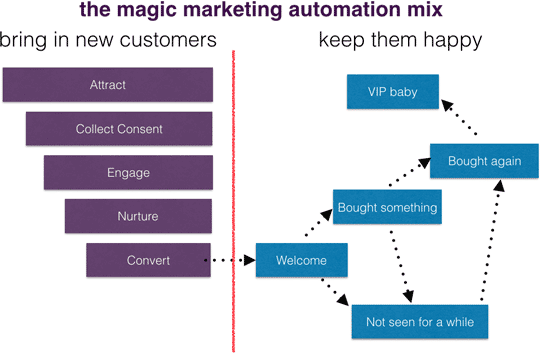 Marketing Automation is the how. Imagine you’re a small retailer building an online shop. You need to be able to input products, process deliveries and orders, and highlight your top products to customers as they visit your site. If you’re more on the creative side of the spectrum, you’ll probably pick a self-service e-commerce solution, something simple to set up and doesn’t need a technical expertise – something like Shopify, BigCommerce, or even Squarespace. It’s a great way to start. A solution, which offers you this manual flexibility, and usually have everything ‘built-in’. If you’ve got a limited number of products to sell, a small number of suppliers, and a moderate number of orders to process each week, a manual-input solution is fit for purpose. It does the job and sets you on your way quickly. But if you are a more complex business, working with a large number of product lines, multiple suppliers, distribution centres, and fulfilment centres; handling thousands of orders, from multiple points of sale, and delivering your products to customers all over the world. It is the data that makes the difference. If you want to use the power of data, better choose a platform that can handle it. Then, in all likelihood such webshop software isn’t going to be the best option for you. You are going to need something a bit more heavy-duty and something that needs a bit of technical expertise, an ecommerce platform like Magento, or Prestashop. These are more technical solutions, but they will coordinate all supply-chain steps, provide a seamless service to website visitors, wherever they’re accessing your site from, and ensure your products are delivered at their destination in a timely, predictable manner. Similar seamless experiences can be achieved with automated marketing. Traditional Email Marketing requires the marketer to decide to write and send an email, to determine the content and select which list(s) to send that email to. 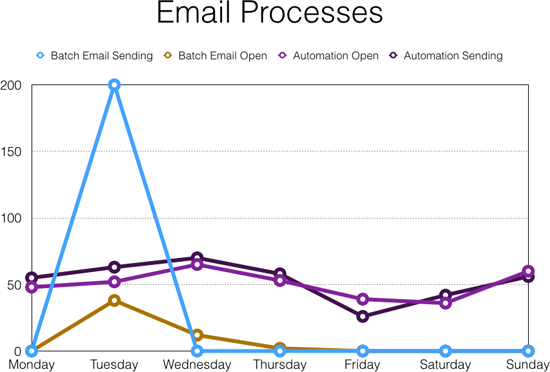 This manual process delivers email based on when the sender wants to send the message – e.g. every Tuesday 11:30am – to your audience’s inboxes. Now I’m sure you’ll do tests to try to establish the ‘optimum’ time to get the best response, but the likelihood is that if you are sending newsletter style email to stimulate sales, and you are setting the time, then you’ll get a open rate of between 15%-30% (and 30% would be a real success for this type of message). My point is that even if you are successful, the larger proportion of your email list is apathetic – not opening, not engaging. But crucially not unsubscribing…so they remain in the game (well in your game anyway, but they aren’t playing). The result is low open rates, low click-through, and lower than possible Return on Investment (ROI). We keep doing it because we know we must send email marketing communications. But if you keep doing the same thing, then you’ll get the same results, namely, Email marketing that isn’t quite as good as it could be. Perhaps it’s the message that drives the response or perhaps is the management of the audience. It’s much more complex than it initially seems. You have lots of variables to deal with. If you are able to manage these variables, and get the right message across to the relevant people – and your email marketing will gain superpowers. Marketing Automation uses the intricacies of customer or prospect data to send targeted email communications as they interact with your business. That’s data from your site, your store, or other contact points that you offer. –	Or a specified time period has lapsed since their last interaction with you. Crucially, your marketing is now personalised. 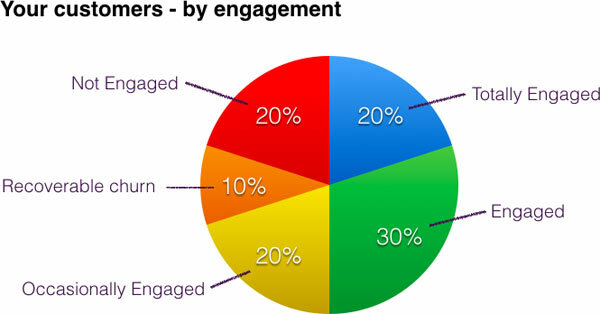 Personalised based on the data you hold about your audience, and in context to their behaviour. If you want to go even further, add customer lifetime value to your customer segmentation strategy and you’ll be able to reward those who’ve continued to reward you with custom. That’s the magic mix that adds superpowers to your marketing activity, and in our experience with Websand that boosts the open % compared to bulk messages by at least 100%. Overall, we’ve found that once you take the step to Marketing Automation your marketing goes up a level. By delivering timely, consistent, context-based messages, you’ll increase customer loyalty and see a marked improvement in audience growth and retention. All of this adds up to fantastic ROI and measurable results for your marketing team. Of course, it’s not for everyone, and lots of different approaches to marketing automation exist – from the low cost instant set up to the heavy investment 12-week integration and training course variety. The low-cost instant variety of marketing automation being the self-service plug in variety – based around API’s, these are increasingly being offered by ESP’s but can be limited in features and options, and you’ll need some in-house technical expertise to get things started. The heavy investment variety; are the fully integrated corporate platforms that come with a training course, full account management support and are often implemented as a full-scale corporate project. Heed the words of Abraham Lincoln. In our experience (as a marketing automation platform provider), it’s the marketing plan rather than the technology that fails. 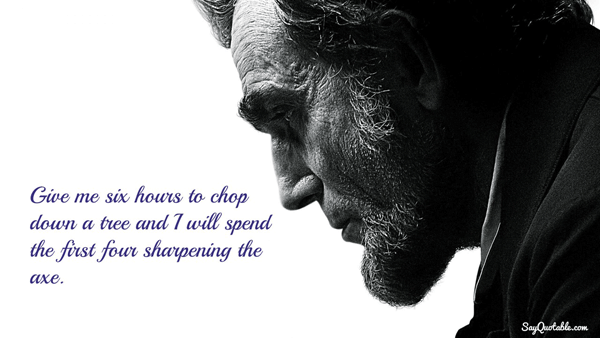 Take heed to the wise words of Abraham Lincoln, “give me six hours to cut down a tree, and I’ll spend the first four hours sharpening my axeG. So before you invest in marketing automation, invest in your marketing plan. You’ll understand what you need, you’ll make a better investment decision and your marketing will be cutting down trees in no time. Saul Gowens has 17+ years in loyalty marketing and has spent the last four years in Marketing Automation as the founder of Websand, a flexible marketing automation platform to support data-driven marketing. Based on Saul’s experiences in building corporate loyalty programmes, Websand is designed to support customer-centric marketing and continual business improvement.